As one of South Australia’s most successful and trusted not-for-profit charities, Crime Stoppers SA is calling on community support to help fight country crime. Why? 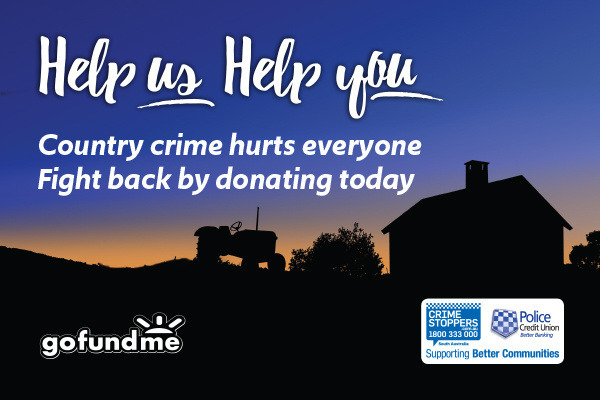 Because crime in rural areas is increasing, with farm crime rates at their highest in highly accessible or very remote areas. Livestock theft across South Australia left farmers $1.2 million out of pocket in 2016/17. In addition, farmers have experienced theft of farm machinery, equipment, vehicles, material, tools and spare parts – all of which are needed to stay operational. Adding to concerns, theft of produce, seed and grain– as well as deliberately lit bushfires – can bring farming communities to their knees. Working in partnership with the community we believe we can make a difference. 100% of all money received by Crime Stoppers SA will be spent on the development and delivery of two crime prevention and awareness campaigns across all country SA locations.